The recently ousted Infinity Ward heads are accusing Activision of delaying an ongoing lawsuit to siphon away their money. In new documents reportedly released today, ex-Infinity Ward heads Jason West and Vince Zampella are accusing Activision of taking its sweet time to beef up its cross-complaint in the lawsuit the duo brought against the publisher over unpaid royalties. West and Zampella claim that Activision continues to add new information to the cross-complaint to have the eventual trial delayed, resulting in the financial harm of West and Zampella. 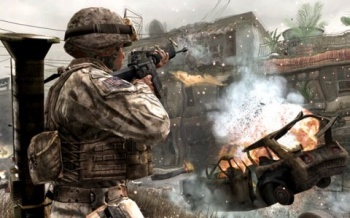 Activision recently amended the counter argument to include EA as a defendant, saying that EA was in cahoots with West, Zampella, and other entities to harm Activision by altering the development of Call of Duty. West and Zampella say Activision knew of EA's alleged involvement more than six months ago, and only waited to add EA as a defendant to have the trial pushed back further than its scheduled date in May. The ex-studio heads say they're "paying for this litigation from [their] own funds," and can't afford to allow Activision to delay the trial any further. They add that the costs associated with the lawsuit have already gone above and beyond their "combined annual salaries." In addition, West and Zampella say that the lawsuit is taking away from the formation of Respawn Entertainment, the duo's new studio. They call any future delay a "distraction" from their business lives, and say they won't be able to properly earn a living if litigation continues for too long. Activision could be using dirty tactics to drain West and Zampella of funds, or it could have been properly securing evidence before naming EA, a billion dollar company, in the case. Activision likely has more money to burn on litigation than West and Zampella, so anything's possible.